DARK HALL MANSION'S THE BEATLES X SHAG "MAY I INTRODUCE TO YOU" LIMITED EDITION PRINTS ON SALE THIS THURS, SEPT 12 + BEATLES.COM EXCLUSIVES AVAIL FOR PRE-ORDER THIS TUES SEP 10!! Dark Hall Mansion, www.DarkHallMansion.com is thrilled to announce its new officially licensed Limited Edition Beatles release: "May I Introduce to You" by leading contemporary artist SHAG. 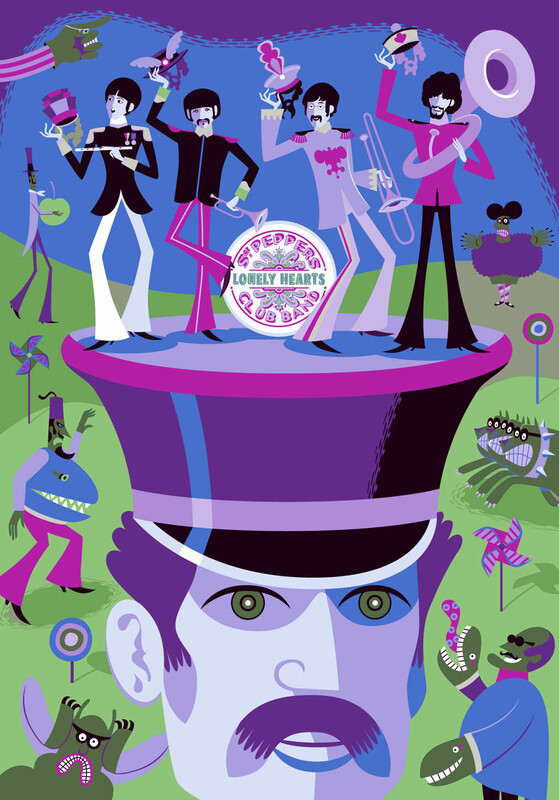 Dark Hall Mansion, working with Apple Corps Ltd, will release their new Beatles x SHAG limited edition screen prints on September 12, 2013. SHAG has captured The Beatles in his unique and distinctively singular style, bringing to life no less than the legendary moment when "Sgt Pepper's Lonely Heart's Club Band" explodes across 1968's kaleidoscopic masterpiece, "Yellow Submarine." SHAG's exceedingly limited print brilliantly showcases both The Beatles and his own unmistakable style. Beautifully hued, his print measures a full 20" x 28" capturing the Blue Meanie's worst nightmare-pure unadulterated joy through music! SHAG's striking rendering of The Beatles as they remove their ever so subtle disguises while the bandstand rises is a landmark moment in Beatles history capturing not only the free wheeling creativity of "Yellow Submarine" but the irrepressible spirit of The Beatles themselves. Each print will be individually numbered and signed by SHAG himself, 20″ x 28″ in size, and beautifully screen printed. With an extremely limited release of only 150 Standard Edition prints available worldwide for all Beatles and SHAG fans it's a Beatles piece no collector will want to miss. The Standard edition Beatles x SHAG "May I Introduce to You" print will price at $225 and will only be available for purchase via lottery through Dark Hall Mansion. Collectors wishing to purchase this edition need only send DHM an email with the words: Beatles x SHAG in the subject line to: info@darkhallmansion.com registering-ANYTIME-during a one week period beginning 9/5/12 and closing at 11:59 PM PST on 9/12/13. At that time all registered email addresses will be assigned a number and entered into a random draw. DHM will then notify the 150 collectors with winning numbers on 9/13/13 and they will have until 11:59 PM PST on 9/14/13 to complete their purchases via Paypal. NO exceptions! Failure to complete the purchase by this time relinquishes their winning position and we will move on to the next person in line on the Beatles x SHAG waiting list. As an added bonus, anyone who has their number selected in the winning draw and completes a purchase of the DHM Standard edition Beatles x SHAG print will also automatically be guaranteed a 'reserve option' to purchase DHM's next SHAG release! That's right, upon completing purchase of the Beatles x SHAG "May I Introduce to You" Standard edition print the purchasing collector will have a GUARANTEED lock to purchase DHM's next SHAG release should they choose to exercise it. And all we'll tell you about the next DHM SHAG release is it's BIG and Officially Licensed!! To qualify to purchase DHM's next SHAG release the purchasing collector of the Beatles x SHAG "May I Introduce to You" must use their exact same Paypal address utilized with their currentpurchase-NO exceptions for any reason. Dark Hall Mansion is also proud to have worked with Beatles.com, The Beatles' official online store, in developing two Exclusive Variant SHAG editions that will only be available through The Beatles own, Beatles.com portal. These two Exclusive and unique Variant SHAG editions for "May I Introduce to You" are also individually numbered and signed by SHAG and highly limited with only 50 and 25 pieces, respectively, available-worldwide!! on Tuesday, Sept 10th, 2013 at 9:30 AM PST when both Beatles.com Exclusives will be available for pre-order right from Beatles.com! 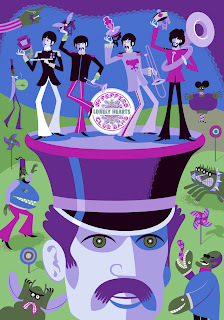 The Beatles limited edition print series is created by Dark Hall Mansion. ‘The Beatles’ is a registered trademark of Apple Corps Limited. Yellow Submarine is a trademark of Subafilms Ltd, 1968. Dark Hall Mansion is a labor of love. We are passionate about art, about the work of print and poster artists present and past, here and abroad, we are committed to bringing their skills to the forefront on projects both compelling and exciting, bridging their studios and creations directly with your walls and personal collections.